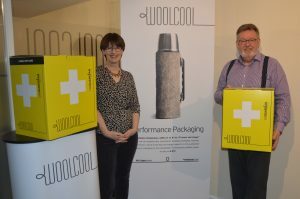 Photo: Angela Morris and Keith Spilsbury launch Woolcool LifeGuardian. A revolutionary new wool packaging product, which is set to save lives across the globe and create jobs in Staffordshire, will be launched to the world’s pharmaceutical companies at an international exhibition in January. LifeGuardian, by Staffordshire packaging experts Woolcool, exceeds World Health Organisation standards for transportation of medicines and vaccines. This means that temperature sensitive medicines can be kept in optimum condition during transportation, solving a problem that has led to around 50 per cent of vaccines being unusable on arrival at their destinations. “Woolcool is making pharmaceutical companes rethink their packaging and this will dave lives,” said Managing Director Keith Spilsbury. The wool based, eco-friendly packaging system is being officially unveiled at the Temperature Controlled Logistics Europe event, following three years of extensive scientific testing. The Frankfurt based event, described as the Cool Chain Logistics Summit, takes place between 25 and 28 January, 2016. LifeGuardian is a new product tailored for the pharmaceutical industry from Woolcool, a company which previously developed a mail order packaging system that has set new standards for the transportation of chilled and perishable food. Woolcool opened a factory in Stone in July and has experienced major growth, currently employing more than 40 people. Using 100 per cent pure, clean wool – that is too coarse for clothing or other textiles – the company has devised a unique and innovative way of keeping medicines and food cool for longer. As a result. temperature sensitive medicines can be kept for longer at an optimum 2-8⁰C during transportation across the globe. Meeting World Health Organisation standards designed to deliver vaccines to health bodies in a usable condition is only part of the challenges being phased by the pharmaceutical industry, explained Keith Spilsbury. He added: “Pharmaceutical companies are desperate to find a valid cold chain packaging solution as they now have to prove compliance with new European Union Good Distribution Practice (GDP) guidelines. “We are confident that Woolcool gives companies the solutions they have been waiting for. “Woolcool is taking the need for temperature controlled packaging out of the equation. Our LifeGuardian insulated packaging liner can keep high risk medicines at the correct temperature for twice as long as industry standards. “Add to that the facts that, when compared to a standard box using polystyrene insulation, a LifeGuardian box is 25 per cent smaller, 50 per cent lighter and still has 25 per cent more space inside for the product. Woolcool’s founder Angela Morris, began researching the insulation properties of wool in 2003. Following a long period of research and development, Woolcool food packaging was launched in 2008. It is now being used to transport food from farm to market and by food box companies including Abel and Cole and Hello Fresh. The unique product consists of a cooling pack with a slab of needle-felted wool inside a recyclable film liner. The liner is full of tiny holes, allowing the wool to breathe and so create a controlled mini-climate within the pack. Further years of research, aided by Government research funding via Innovate UK, has led to the birth of LifeGuardian. The new developments are set to be hugely beneficial to Stone, Staffordshire. Pharmaceutical boxes currently make up around 10 per cent of Woolcool’s business but forecasts state it will quickly overtake food, resulting in yet more new jobs at Woolcool’s base on the Walton Industrial Estate, Stone.